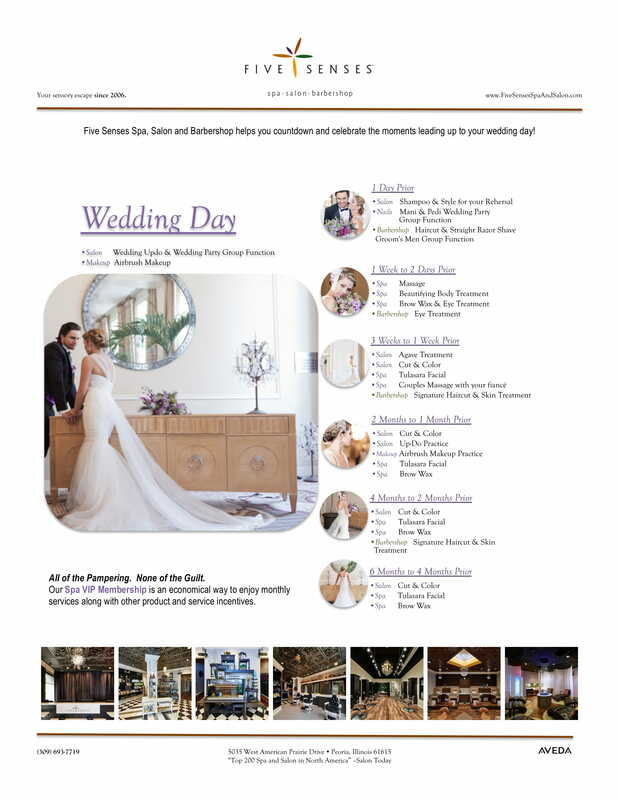 Five Senses Spa, Salon and Barbershop helps you countdown and celebrate the moments leading up to your wedding day! From hair services and straight razor shaves to pampering spa services, manicures and pedicures, Five Senses has you and your wedding party covered from head to toe! Enjoy services on your own or as a couple as you prepare for your wedding day. Our Barbershop Incentive Card along with Beauty & Spa Memberships, offer economical ways to enjoy monthly services with various product and service incentives. Create memories while receiving services together as a group. Our All-Inclusive Group Functions offer various hair, makeup, nail and spa packages complete with Aveda product swag bag for each individual, food bar, chocolate fountain, Aveda tea, water, coffee, all gratuity and taxes. Our hair, makeup and airbrush makeup services can be provided as an Off-Site Function. Five Senses Spa, Salon and Barbershop helps you countdown and celebrate the moments leading up to your wedding day! Our Spa VIP Membership offers an economical way to enjoy monthly services along with other product and service incentives.